John Paley was the son of Oliver Paley. Oliver was born 7 July 1864 in Baildon. He married Annie Elizabeth Skirrow 14 May 1887 in Bradford Cathedral. Oliver was a worsted spinner overlooker living at 16 Gordon Terrace in Saltaire. By 1891 they were living at 36 Helen Street in Saltaire. John, the second youngest of six children, was born 1896 in Saltaire. By 1901 they were living at 22 Shirley Street in Saltaire. Oliver died in 1907. In 1911 widowed Annie lived with her children at 23 Wycliffe Road in Shipley. John was an office boy working for a clock manufacturer. John served as a Private (lewis gunner) in the 19th Battalion Durham Light Infantry. He attested 29 November 1915 and he was mobilised 8 March 1916. John died 25 August 1917. His grave can be found at Villers-Faucon Communal Cemetery near Peronne in Northern France. John is remembered on the Rolls of Honour at Nab Wood, St. Pauls and Saltaire Wesleyan Chapel. 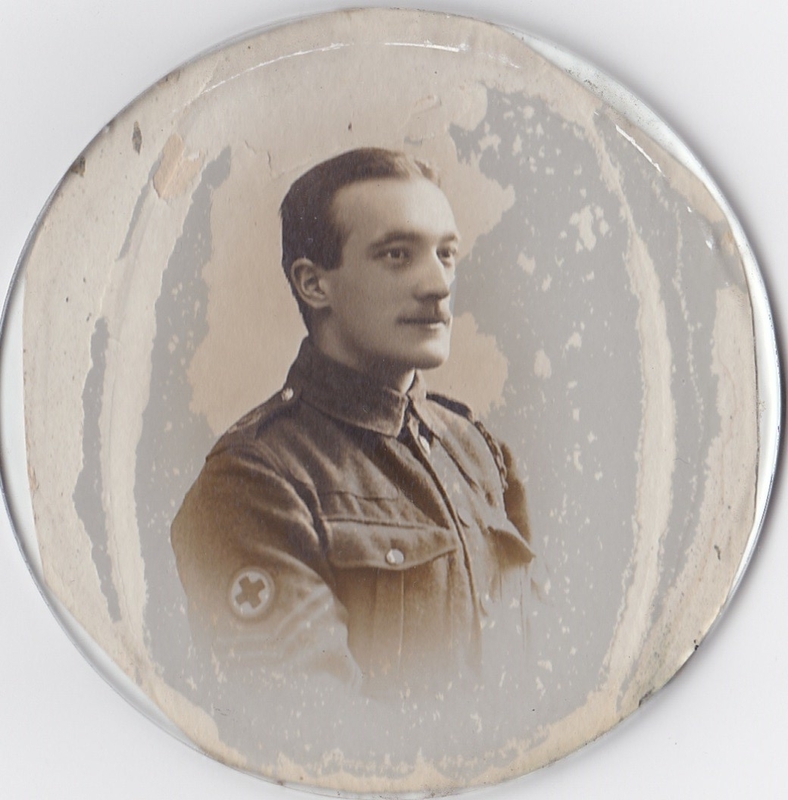 John had an elder brother, Ralph, who also gave his life in serving his country in the war. Ralph Paley was the son of Oliver Paley. Oliver was born 7 July 1864 in Baildon. He married Annie Elizabeth Skirrow 14 May 1887 in Bradford Cathedral. Oliver was a worsted spinner overlooker living at 16 Gordon Terrace in Saltaire. By 1891 they were living at 36 Helen Street in Saltaire. Ralph, the fourth of six children, was born 1894 in Saltaire. By 1901 they were living at 22 Shirley Street in Saltaire. Oliver died in 1907. In 1911 widowed Annie lived with her children at 23 Wycliffe Road in Shipley. Ralph was a wool sorter working in Saltaire Mill. Ralph enlisted at the outbreak of the war and he served as a Private with the 1st Battalion Prince of Wales’s Own (West Yorkshire Sentinel). Ralph died 26 April 1918 and his gave can be found in the Perth Cemetery (China Wall) near Leper in Belgium. Ralph is remembered on the Rolls of Honour at Nab Wood, St. Pauls and Saltaire Wesleyan Chapel. Ralph had a younger brother, John, who also gave his life in serving his country in the war. Thomas William Park was the son of Robert Park. Robert was born c1871 in Kendal. He married Margaret Wood in Kendal in 1891. Thomas, the fifth of ten children, was born 1899 in Dacre near Pateley Bridge. In 1901 the family were living in Killinghall with Robert working as an agricultural labourer. By 1911 they were living in Harrogate and sometime between 1915 and 1918 they moved to 74 George Street in Saltaire. 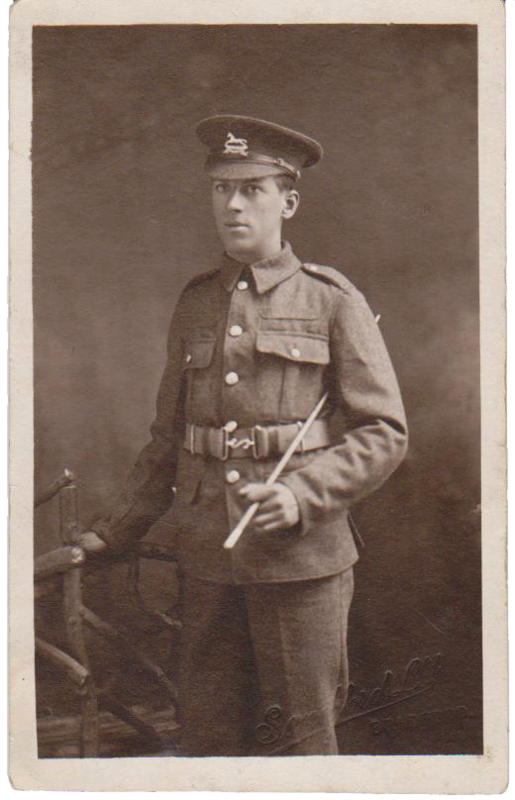 Thomas served as a Private with the 5th Battalion Kings Own Yorkshire Light Infantry. He died 20 July 1918 and he is remembered on the Soissons Memorial in Northern France. He is also remembered on the Rolls of Honour at Nab Wood and St. Peters. 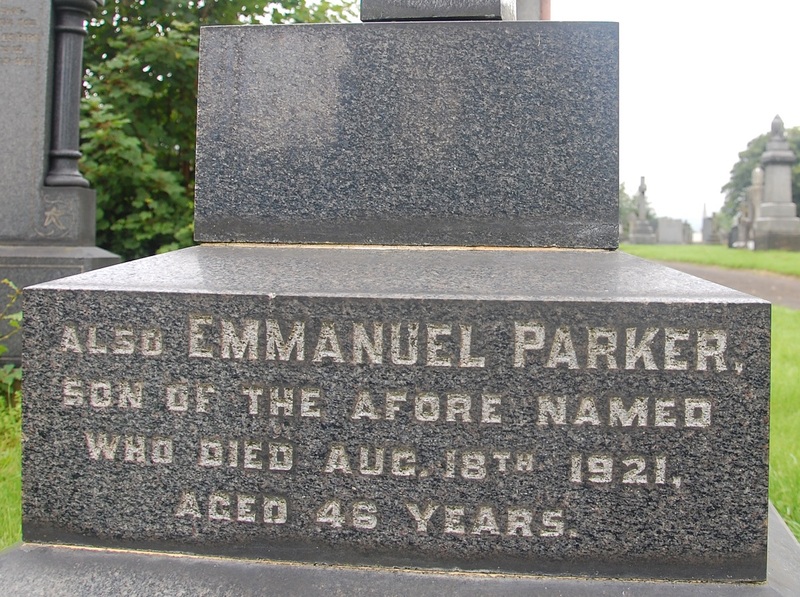 Emmanuel Parker was the son of Thomas Rushworth Parker. Thomas was born 1834 in Kettlesing (near Harrogate). He married Elizabeth Blythe, eight years younger than him, 25 December 1864, at Bradford Cathedral. They had a daughter, Frances Mary Eveline, born 1866. By 1871 they were living at 23 Mary Street in Saltaire (next door to Elizabeth’s parents). Thomas was working as a weaver. By 1881 they were living at 23 Shirley Street in Saltaire, where they remained until they died, with Thomas working as a draper assisted by his children. Thomas died 21 January 1900 and he was buried at Nab Wood Cemetery in Shipley. His widow was buried alongside him when she died, 19 February 1925. Frances never married and she joined her parents when she died, 1 March 1942. Emmanuel was born 1875 in Saltaire. In 1891 he was assisting his father in his drapery business. Emmanuel joined the army, 28 April 1893. He served with The Royal Highlanders (Black Watch) and he rose to the rank of Staff Sergeant before he was discharged, 1 May 1920. He saw action in both the Second Boer War and the First World War serving in South Africa, India, France and the Persian Gulf, and he was injured on more than one occasion. In December 1901 he was mentioned in despatches for distinguished conduct in the field. Sadly Emmanuel died 18 August 1921, less than a year after leaving the army. He was buried in Nab Wood Cemetery, Shipley alongside his father. His widow, Elizabeth, was living at 78 Grosvenor Road, Shipley, when she died 21 November 1952. The following letters have been received from Sergeant E Parker, of Saltaire, who is attached to the 42nd (“Black Watch”) B Company. The first arrived on the 17th and the second on the 22nd instants. Considerable uneasiness was felt when the name of Sergeant Parker appeared among the wounded after Magersfontein, but fortunately his wound was not serious, and by this time he has in all probability re-joined his regiment. Dear Parents and Sister, - Our force, under Lord Methuen, is at Modder River, about 50 miles further north; but, I, along with others who have been wounded, have been sent here until we get better, out of the way of the Boer bullets. We had a big battle at Magersfontein on the 11th December (Monday). It commenced at 4 a.m. and went on all day. We could not get near enough to take the position at the bayonet’s point. Our force suffered heavily. The Highland Brigade got the worst of it by far, as you will see by the papers. General Wauchope was killed, and six officers of the Black Watch, or about half of my company, being left. I was wounded, but I am glad to say it was only a flesh wound through the back of hip. I am almost better now, and I have only had ten days’ rest. The position we attacked is not taken yet. The Boers are holding on to it, for it is their last strong position between here and the diamond mines of Kimberley. We, that is, our forces at the front, are only 20 miles from Kimberley, so I suppose there will be a grand triumphal march into that place one of these days. We get almost anything we want in the hospital here – cigarettes, jam, apricots, etc., all sent us by the people in Britain and elsewhere. The principal hospital is at Wynberg – all the bad cases are sent there – and is about 600 miles from here. I got your box and letter this morning, and am smoking some of your tobacco at the present moment, and have the tam o’ shanter on my head. The weather here is very hot during the day and cold during the night. There have been a lot of men in the hospital with sunstroke. There will be no more fighting for about a month – there are a lot more troops coming out and we are waiting for them. I am lucky to escape with a slight wound, when I see some of the poor fellows, maimed and disfigured for life, who have gone to Wynberg. Everyone here seems cheerful. There are about 40 Boer wounded prisoners here. One of them fought at Majuba Hill. I am almost ready to re-join my regiment again at the front, for my wound is almost better, gives me little or no trouble. We are expecting Lord Roberts have shortly. His son was killed in Natal a few days ago, so I suppose he will try to give the Boers a severe dusting. There has been no other battle here; everything is quiet for Christmas. Our fellows at Medder River are entrenching round the enemy’s position, for it is too strong for infantry to take in the ordinary way, for we are fully exposed to their fire for two miles before we can get to close quarters, so they are going to make a siege of it – I believe another Sebastopol – working nearer each night, and when the enemy look next morning they will find us a hundred years nearer. The Boers are entrenched for six miles, so you can imagine the strength of the position. We are waiting for another division to come up this way – what we want is more artillery and cavalry. There are two infantry regiments here – the Cornwall Light Infantry and Shropshire Light Infantry. The Scots Greys, the famous cavalry regiment, is here, and there is a battery of artillery. I cannot say that I have enjoyed myself much this Christmas, for, as your Christmas card sent to me says, memory of bygone Christmastides when I have not enjoyed myself very much, is different to being in a tent, wounded; but under the circumstances I have not done badly, for we have cards, and many a game of whist I have played. We get an awful lot of things from the good people – fruit, jams, milk, sponge cake, etc. Sunday and Monday, the 24th and 25th, were two awfully hot days. I laid in my tent with my hospital clothes on, which are very thin, and with my sleeves rolled up, and even then I perspired. I suppose there will be skating at home just now. If you had been this morning you would have seen hundreds of millions of locusts. They are of a light colour, and look very pretty in the sun. They did not alight here, for there is no cultivation, and they like a nice green, fertile spot. They went to Kimberley. We got a pound box of tobacco given to us at Christmas. I have nothing else to do but eat, sleep, and smoke, play cards, draughts, read papers, etc. I don’t leave my tent much during the day, for it is too hot, but in the evening I stretch myself and take a short walk. When we are better we are marched out of hospital, and continue down here for a week to get stronger, then we are sent up to the front again. I expect to be up there in another fortnight. You wish me luck? Well, that is the only thing here to pull one through, for the bullets fly about in rather large numbers. George Robert Parker was the son of William Parker. William was born c1873 in Cundall near Harrogate. He married Annie Emily Walls in 1892. George, the second eldest of eight children, was born c1895 in Boroughbridge. In 1901 the family were living in Hunslet with William working as a labourer. By 1911 they were living in Knaresborough. George served in and survived the war. By 1918 he was living at 2 Edward Street in Saltaire (now demolished). John Herbert Thomas Parker served in and survived the war. In 1918 he was living with John Herbert Morrell Rhodes at 3 Mawson Street in Saltaire. Thomas Sutcliffe Parker was the son of John Edward Parker. John was born 29 July 1857 in Huddersfield. He was baptised 24 October 1858 in St Peters in Huddersfield. John married Bertha (Betty) Sutcliffe 18 May 1880 at Christ Church in Bradford. In 1891 they were living at 29 Clifton Place in Shipley with John working as a newspaper reporter. John was the golf correspondent for 'The Yorkshire Observer' under the name of 'Taxameter' for some 50 years and was a founder member of the Northcliffe Golf Club. Thomas, the second youngest of eight children, was born 31 July 1892 at 4 Victoria Road in Saltaire. The family lived here from 1892 to 1899. Thomas’s mother, Betty, died 27 April 1895 and she was buried in Nab Wood Cemetery in Shipley. Widowed John married Dora Williamson 11 January 1899 in Bradford Cathedral. Dora was the matron of Salts Hospital. In 1901 the family were living at 18 Hall Royd in Shipley. Dora died 10 January 1903 and she was buried alongside John’s first wife in Nab Wood. In 1911 twice widowed John was living with his children at 25 Wellington Crescent in Shipley. Thomas was working as an invoice clerk. John died at 25 Wellington Crescent 18 July 1943 and was buried alongside his two wives in Nab Wood. In his will he left £3667 0s 10d, worth c£150k in 2016. Thomas served in and survived World War One and his service record is somewhat of a puzzle. He served with the 62nd (West Riding Division). In April 1915, he was in France as a gunner with the Royal Field Artillery. Later he was a staff sergeant in the Royal Army Medical Corps. Thomas married Alice Irene Broadbent 6 October 1922. They lived at 26 Hirst Wood Crescent in Shipley, until around 1928 when they moved to 12 Bromley Road. Thomas worked as a bookkeeper; for a long time he worked for a company of wool brokers in Hope Street in Bradford. They opened up an office in South Africa and Thomas was offered a job there but he turned it down. Alice died 30 August 1938. She was buried with her parents in Nab Wood Cemetery. Widowed Thomas married Edith Jones 20 December 1941 in Lancaster. Edith was born 30 December 1909 in Lucknow, India. Edith’s father, Arthur Jones, was a serving soldier in India. He saw action in France before he was killed at Ypres 14 February 1915. By now Thomas was working for “Wool Control”, which would become The British Wool Marketing Board in 1950. It is believed Thomas was a local ARP warden in World War Two. Thomas and Edith lived at 15 Fernhill Avenue in Shipley until around 1962 when they moved to 11 Katherine Street in Saltaire. Thomas died in Salts Hospital 29 January 1979, and he was buried in Nab Wood Cemetery. His widow, Edith, joined him when she died 5 August 2005. Frank Parkinson was the son of Frank Buxton Parkinson. Frank Buxton was born 1867 in Bradford. He married Sabina Heaton 12 July 1890 at Bradford Cathedral. In 1891 they were living at 18 William Henry Street with Frank Buxton working as a stuff warehouseman. Frank, the eldest of five children, was born 1891 in Saltaire. In 1901 the family were living at 2 Moorhead Lane in Shipley with Frank working as a stuff buyer. By 1911 they had moved to 3 Albert Road (now renumbered 5) in Saltaire; the family remained there throughout the war. Frank served in and survived the war. He was working as a salesman when he married Cicely Hilda Holloway 2 April 1919 at St Pauls Shipley. Frank had two brothers, Harold and George, who also served in the war. George Heaton Parkinson was the son of Frank Buxton Parkinson. Frank was born 1867 in Bradford. He married Sabina Heaton 12 July 1890 at Bradford Cathedral. In 1891 they were living at 18 William Henry Street with Frank working as a stuff warehouseman. George, the second of five children, was born 8 May 1893 in Frizinghall. In 1901 the family were living at 2 Moorhead Lane in Shipley with Frank working as a stuff buyer. By 1911 they had moved to 3 Albert Road (now renumbered 5) in Saltaire with George working as a foreign correspondent; the family remained there throughout the war. George enlisted 2 Dec 1914 with the 6th Battalion Prince’s of Wales’s Own West Yorkshire Regiment. He was promoted to Lance Corporal 1 June 1915. It was as a Sergeant he went to the USA 23 July 1917 on a recruitment drive. He returned to the UK 29 Dec 1918 and he was serving with the Labour Corps when he was discharged 6 February 1919. George married Doris Whitton 15 June 1921 at St. Barnabas Heaton. The married couple lived in Shipley before moving to Lancashire. In 1936, when his father died, George was a director in a textile company. George died in 1974. George had two brothers, Frank and Harold, who also served in the war. Harold Milligan Parkinson was the son of Frank Buxton Parkinson. Frank was born 1867 in Bradford. He married Sabina Heaton 12 July 1890 at Bradford Cathedral. In 1891 they were living at 18 William Henry Street with Frank working as a stuff warehouseman. Harold, the third of five children, was born 1895 in Bradford. In 1901 the family were living at 2 Moorhead Lane in Shipley with Frank working as a stuff buyer. By 1911 they had moved to 3 Albert Road (now renumbered 5) in Saltaire with Harold working as an office boy; the family remained there throughout the war. Harold served in and survived the war. He died 1 March 1951 in Turkey. Harold had two brothers, Frank and George, who also served in the war. David Peate was the son of Alfred Peate and his second wife Ellen. Alfred was born 1849 in Yeadon. Working as a warp twister he married Harriet Rushworth 14 January 1871 at Bradford Cathedral. They lived in Shipley having two sons until Harriet died. Widowed Alfred then married Ellen Brotherton 19 December 1885 at Bradford Cathedral. David, an only child to Alfred and Ellen, was born 1887 in Shipley. In 1891 the family lived in Shipley with Alfred working as a warp twister. In 1901 David working as a clerk was living with his Auntie, Selina Brotherton, at 24 Titus Street in Saltaire. By 1911 he was living with his widowed mother at 9 Ferrand Road in Shipley. David served in and survived the war. He married Elizabeth Stead 1 September 1923 at Holy Trinity Idle. They lived at 8 Nab Wood Rise Shipley until David died in 1960. David is remembered on the Saltaire URC Roll of Honour. Lawrence Pedley was the son of Peter Pedley. Peter was born c1860 in Tong Park. He married Annie Elizabeth Booth 13 November 1886 at St. Wilfrid Calverley. In 1891 they lived in Idle with Peter working as an iron moulder. Lawrence, the second youngest of six children, was born 1898 in Windhill. In 1901 the family lived at 98 Leeds Road in Shipley. By 1911 they had moved to 40 Aire Street in Windhill; Lawrence was a scholar and part time doffer. By 1914 they were living at 28 Shirley Street in Saltaire. Lawrence served in and survived the war. Working as a cloth warehouseman he married Elsie May Ingham 25 December 1920 at the Primitive Methodist Church in Saltaire Road in Shipley. Lawrence was living at 28 Shirley Street; Elsie was a woollen weaver living at 2 Katherine Street in Saltaire. The married couple lived in Baildon; by 1945 they were living in Keighley. Lawrence died 8 October 1957 at St Johns Hospital in Keighley. Walter Pedley was the son of Luke Pedley. Luke was born c1846 in Gargrave. He married Elizabeth Milton 4 November 1866 at Bradford Cathedral. Luke spent all his working life as a blacksmith. In 1871 they were living at 3 Murgatroyd Street in Shipley and 1881 at 27 Regent Street in Shipley. Walter, the eighth of nine children, was born c1883 in Saltaire. In 1891 they were living at 7 William Henry Street in Saltaire. By 1901 they were living at 31 George Street in Saltaire with Walter working as a stone quarryman. Walter married Edith Starr 10 April 1909 at Holy Trinity, Bingley. They lived at 37 Whitlam Street in Saltaire. They had a daughter, Nellie, born 20 August 1914 in Saltaire. Walter served as a Corporal with the 2nd/7th Battalion Duke of Wellington’s (West Riding Regiment). Walter died 28 November 1917 and he is remembered on the Cambrai Memorial, Louverval in Northern France. Walter is also remembered on the Rolls of Honour at Nab Wood and St. Peters. Harry Poole was the son of Oliver Poole. Oliver was born c1857 in Shipley. He married Harriet Walsh 2 July 1882 at St. Pauls Shipley. Oliver spent all his working life as a drayman. In 1891 they were living at 56 Field Street in Shipley. Harry, the eighth of nine children, was born c1892 in Shipley. In 1911 they were living at 36 Rhodes Street in Saltaire with Harry working as a cloth finisher. Harry served as a Private with the 2nd Bradford Pals Regiment, otherwise known as the 18th Battalion Prince of Wales’s Own (West Yorkshire Regiment). He died 12 June 1917 and he is buried in the Point-Du-Jour Military Cemetery, Athies in Northern France. Harry is remembered on the Rolls of Honour at Nab Wood, St Pauls and St. Peters. Arthur Dalby, brother in law to Harry, served in the war and survived. Henry Priestley was the son of William Edward Priestley. William was born 1848 in Greetland (near Halifax). He married Elizabeth Tatham in 1876 in the district of Settle. In 1881 & 1891 they were living at Burton in Lonsdale with William working as a labourer. Henry, the second youngest of ten children, was born c1894 in Burton in Lonsdale. From around 1901 to 1915 the family lived at 71 Victoria Road in Saltaire; by 1918 they were at 25 Albert Road (renumbered now 49) in Saltaire. Henry, working as a painter, enlisted 2 December 1916. Having served as a Private with both the West Riding and South Staffordshire Regiments he was discharged 10 January 1920. Henry married Clara Farrar 21 January 1925 at St. Peters Shipley. Clara was a pattern weaver living at 50 Titus Street in Saltaire. In 1931 the married couple were living at 45 Caroline Street in Saltaire. Henry is remembered on the Saltaire Wesleyan Church Roll of Honour. He had a brother, Rowland, who also served his country and fought in the war. Rowland Priestley was the son of William Edward Priestley. William was born 1848 in Greetland (near Halifax). He married Elizabeth Tatham in 1876 in the district of Settle. In 1881 & 1891 they were living at Burton in Lonsdale with William working as a labourer. Rowland, the youngest of ten children, was born 9 May 1896 in Burton in Lonsdale. From around 1901 to 1915 the family lived at 71 Victoria Road in Saltaire; by 1918 they were at 25 Albert Road (renumbered now 49) in Saltaire. Rowland, working as a packer, enlisted 19 April 1915 and he was mobilised 30 May 1915. He served as a Driver with the 2/2nd West Riding Brigade Royal Field Artillery until he was discharged 11 May 1919. Rowland lived with his parents in Albert Road until 1940 when he moved to 20 Carlton Avenue, Shipley to live with his sister, Ruth, and her husband Robert Chapman. Rowland died in 1982. He is remembered on the Saltaire Wesleyan Church Roll of Honour. Richard He had a brother, Henry, who also served his country and fought in the war. Arthur, the younger of two sons, was born 1896 in Saltaire. In 1901 the family were living in Keighley, moving to Saltaire before 1911, living at 9 Katherine Street. In 1914 the family moved to 69 George Street in Saltaire, where they remained throughout the war. 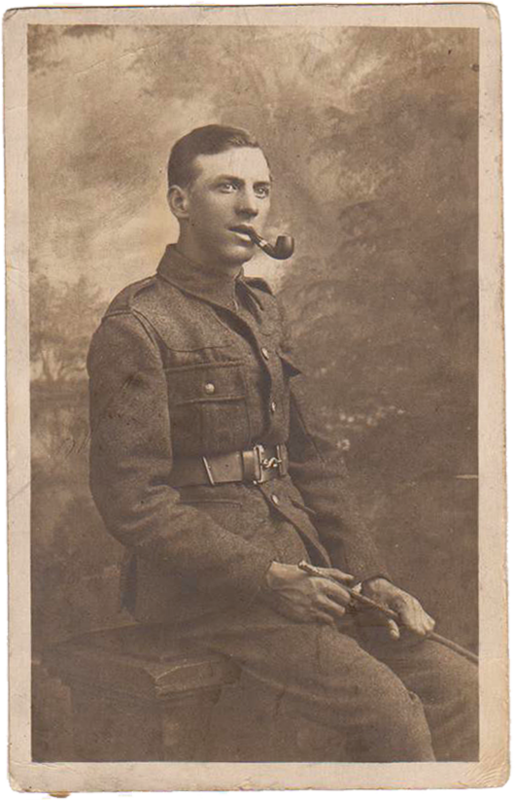 Arthur, working as a clerk in the collections department at Shipley UDC, enlisted in August 1915. He saw service with the 16th Battalion Prince of Wales’s Own West Yorkshire Regiment (1st Bradford Pals). Arthur survived the war to marry Elsie Swallow in 1922. They had two children; Sylvia and Anthony. For 10 years they lived with Arthur’s parents, before they owned their own house in Shipley in 1932. Arthur died 23 May 1952, leaving his widow living at 23 Hirst Lane Shipley. Arthur had an elder brother, Herbert, who also fought in the war. Herbert Thomas Pringle was the son of Ernest Thomas Pringle. Ernest was born 1867 in Liverpool. He married Sophia Lacey 1889 in Liverpool. Herbert, the elder of two sons, was born 16 May 1890 in Liverpool. In 1891 the family were living in Bradford with Ernest working on the railway. In 1901 they were living in Keighley, moving to Saltaire before 1911, living at 9 Katherine Street. In 1914 the family moved to 69 George Street in Saltaire, where they remained throughout the war. Herbert married Louisa Slade 29 May 1915 at St Walburgas Shipley. They had five children; Winifred (b1916), Daisy Alberta (b1917), Ronald (b1919), and twins Marjorie and Maurice (born 1924). Throughout the war they lived at Melbourne Street Shipley. Herbert, working as a tram conductor, enlisted 8 December 1915 and was held in reserve until he was mobilised 14 April 1916. Herbert saw action in France as a Private with 20th Battalion Prince of Wales’s Own West Yorkshire Regiment. He was discharged 1 April 1919 to live with his family in Baildon. From 1928 they lived at 11 Carlton Walk, Shipley. Herbert married for the second time when in 1934 he wed Margaret Josephine Smith in Burnley. From 1936 to 1948 they lived at 11 Albert Road in Saltaire. Herbert died in 1980. Herbert had a younger brother, Arthur, who also fought in the war.